As a tech nerd and general failure at life, I often sit and fantasize about the perfect virtual reality set up I would create if I had the resources. From a very young age, I was taken by the idea of a holodeck and what humans could achieve with such a complex tool. I was convinced that by the time I was in my 30’s we would have more than just blurry images and cardboard glasses to create 3D images. And, well, for the most part, I was right. At the age of 26, we already have holographics, haptic suits and virtual headgear. That being said there’s still a long way to go before we reach a state of full emersion. The matrix isn’t here yet and frankly, I don’t believe any of us are even ready for that anyway. BUT. 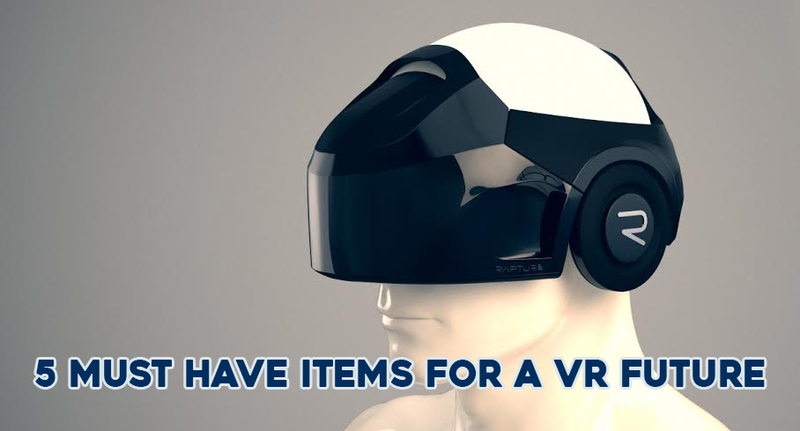 If I were to create a complete virtual experience, here are 5 items I would use to do it. Sorry Oculus, I know you were the first and you will always have a special place in my heart but the HTC Vive just has more. Created by Valve and HTC for the best VR experience yet, this baby packs in 70 sensors to offer 360-degree head tracking as well as a 90Hz refresh rate, the key to keeping down latency. Which is the technical term for the effect that causes motion sickness. The Vive also allows for more range of movement than other heavy duty connected headsets. Unfortunately, you are still restricted by a connection to your device, so it’s not completely mobile. But that’s just the price you will have to pay in order to get such amazing graphical output. The DayDream is used for a cheaper and more mobile version of virtual reality. And from what I have seen of Google’s new DayDream I can tell I am going to like it. The DayDream is not just a plug and play system that allows you to see what’s on the screen of your mobile device. It’s a complete experience, with its own navigation system and controller. This allows you to view things like Google Street View, YouTube VR, movies and games in a virtual space. The DayDream, like Google Cardboard, uses a phone to run your virtual environment so don’t expect that same power as the Vive. But you can still immerse yourself in a surround view experience. You will also have to find a phone that is DayDream ready and there are only a few on the market right now. One such phone being Google Pixel which was released in October this year. When I first started looking into virtual reality as a teenager, there was very little on the market compared to what we have today. However one of the most exciting discoveries I made in that time was a little device called the Emotiv. While the technology has been around since the 80’s, it’s only been since the early 2000’s that EEG technology has been used commercially to integrate our minds with technology. This device was created by Emotiv Systems, an Australian electronics company developing technologies that evolve human-computer interaction through EEG technology. Emotiv Systems produced the EPOC headset, a peripheral that targeted the gaming market for Windows, OS X and Linux platforms. The EPOC has 16 electrodes and was originally designed to work as a brain-computer interface (BCI) input device. While the EPOC is mostly used to help people with disabilities, its applications in other walks of life is endless. And, hey, if it helps make VR even more exciting, then that’s a bonus, right? As a kid, I would sit on the balcony outside my folk’s house and listen to music. I often imagined being able to create music with just the wave of my hand or a movement of my fingers. Today that is made possible with a pair of Sound Space Musical Gloves. Developed by Ray Li and Michael Ndubuisi, Sound Space Gloves uses electromagnetic sensors to track the exact position of the gloves in space. The motion of the musician’s hands can trigger prepared loops of sound, play different musical notes and add musical effects. For now the SoundSpace is used for music but this could also be expanded to gaming to create fully immersive experiences that VR headset peripherals can’t. This one is probably the most exciting item on my list. For a long time, we have struggled with the logistics of how to allow ourselves to feel a virtual environment. For a long time, we theorized that we could use electrical impulses to simulate sensations on the skin. Which is exactly what the TeslaSuit did. The TeslaSuit comes in two full body suits or you can buy each piece separately. Teslasuit Prodigy Full Body Suit has a 52-channel Haptic Feedback and Climate Control Systems.The Control Unit is powered by a battery that can last for up to 4 days on a single charge of moderate use of Haptic Feedback. With Climate Control System ON, the battery would last for up to 2 hours on a single charge. Teslasuit Prodigy comes bundled with a Software Pack and SDK for developers. Teslasuit Pioneer Full Body Suit has a 16-channel Haptic Feedback System. Control Unit is powered by a battery that can last for up to 4 days on a single charge of moderate use of Haptic Feedback. Teslasuit Pioneer comes bundled with Software Pack and SDK for developers. Teslasuit Pioneer Jacket has a 16-channel Haptic Feedback System, covering your upper body. Teslasuit Pioneer Jacket comes bundled with a Software Pack and SDK for developers. Teslasuit Pioneer Trousers has a 16-channel Haptic Feedback System, covering your lower body. Teslasuit Pioneer Jacket comes bundled with a Software Pack and SDK for developers.